Youth has long been thought of as being a considerable impediment to the artistically successful – live or recorded – music especially that played on the violin. 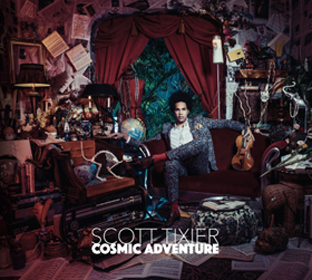 But Scott Tixier has always done everything early, from discovering the music of Eddie South, to his fearless repertoire – all composed (by Tixier) on his first album, Brooklyn Bazaar (Sunnyside, 2012) and his 2016 album, Cosmic Adventure. It doesn’t end there. He was awarded the first prize of “Trophées du Sunside” in Paris when he was only twenty-one and has performed with a clutch of great musicians from Stevie Wonder to Anthony Braxton before his thirteenth birthday. There is not only a strong sense of dance behind all of the music on this 2016 recording, even in the slower pieces, whose speeds he chooses to pull up even further than most, especially in Errol Garner’s ‘Misty’, but of pulse; the forward motion of everything he plays is driven by a continual bebop metronomic tick that, although inaudible, is constantly transferred from Tixier to the listener. That heartbeat runs from ‘Maze Walker’ to ‘Beam Me To Mars’ with a consistency that also supports his choice to order the music by way of what he sees to be their minutely crafted harmonic progression. Through it all Tixier’s playing is so clean, clear and precise (and contained within the cavernous shape of his 1889 Collin-Mezin), and the thought behind everything he plays is so unassailable, that to listen to him is to feel safe that the future of the Jazz violin is in good hands indeed. 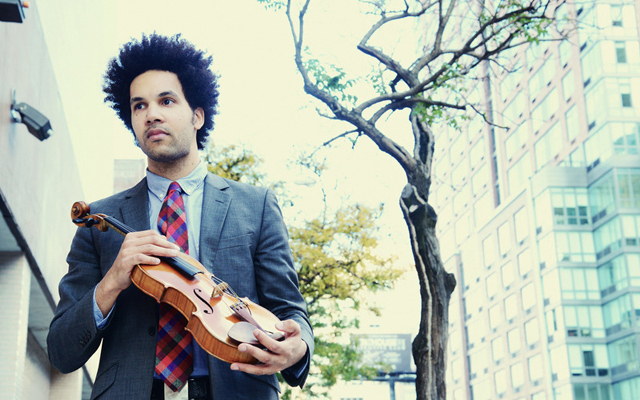 Only a few violinists – from South to Stéphane Grappelli and Stuff Smith to Sugarcane Harris, Jean Luc-Ponty and Billy Bang – make music dance and sparkle quite as brilliantly as Scott Tixier. He heightens the sense of darkness in the lower registers and you get a sense of sunshine breaking through every time he hits the high notes. Every note in every phrase is as exquisitely articulated as it is daring and impossible to predict. On Cosmic Adventure every musician executes Tixier’s music deftly, but there is a special almost intimate relationship between Tixier’s violin and Yvonnick Prene’s harmonica. Even in the most obviously improvised section of the music, it seems that the manner in which they play sounds as if it was written that way; the different of course is while that may have even been so, Tixier and Prene simply lift the music off the page. This is a miraculous album, one in which Scott Tixier balances poetry with a deep sense of form and also, in one fell swoop, makes a case for the future of the Jazz violin. Track List: Maze Walker; Dig It; 100,000 Hours; Troublant Bolero; Mr Tix; Misty; Nil’s Landing; King Of Sorrow; Beam Me To Mars. Personnel: Scott Tixier: violin; Yvonnick Prene: harmonica; Glenn Zaleski: piano; Luques Curtis: bass; Justin Brown: drums; Pedrito Martinez: congas (1 & 2); Chris Potter: tenor saxophone (9).